This game doesn't get nearly as much praise as it deserves. 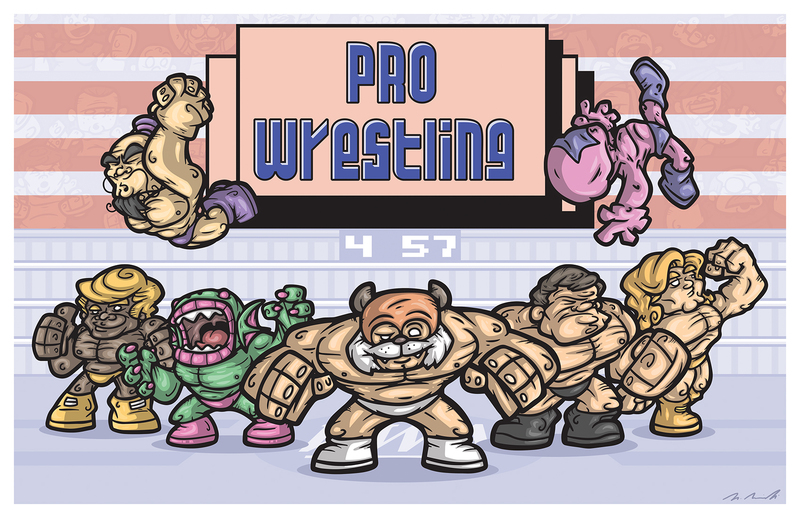 Pro Wreslting is one of those titles from the NES days that always sticks out the most when I think about classic gaming. The music wasn't necessarily great, but I've never forgotten it. Outside of maybe Starman, the characters aren't anything to write home about, but I can remember each one and all their moves. It's simple, it's fun, it's fairly easy, and it somehow managed to capture everything I loved about wrestling during that time. The wrestlers were silly, the moves were gimmicky, and even the mannerisms of the characters (in all their 8-bit glory) matched the goofiness of wrestlers in that era. The game just worked, so I drew it.